At Thompson Granite & Stone, we actually do a lot more than just focus on countertops and other stone-related kitchen amenities. We are involved in a variety of kitchen construction and renovation services. One aspect that we are proud to help Utah homeowners with is repairing or installing kitchen cabinets. Kitchen cabinets tie the look of a kitchen together, and are necessary for a functional kitchen. Here’s some information about the kitchen cabinet services we offer to families and businesses in Salt Lake City, and throughout Utah. Lots of our customers are renovating their kitchens, and are completely overhauling the look and functionality of their kitchen. For this reason, one of our most important kitchen cabinet services is the installation of new cabinets. Our professional technicians help make sure that your new cabinets are aligned and secure, and are formatted so that they make sense with the flow of your kitchen. We also offer a variety of beautiful kitchen cabinets to choose from. Cabinets are a crucial part of a functional kitchen, as they enable you to have all the various cooking tools, decorations, utensils, and dinnerware at your disposal without living in a complete mess. However, continuous usage ensures that, at some point, your cabinets are going to become damaged. If your kitchen cabinets suffer from broken doors, broken hinges, or just simple wear-and-tear, then you can benefit from the experience our team has with kitchen cabinet repair. You don’t have to completely overhaul your kitchen cabinets to give your kitchen a facelift. Sometimes, all you need to do to make your kitchen feel brand new is give a little care to the cabinets you already have. Our team is experienced at repolishing cabinets, and replacing doors and knobs to completely change their look. Refacing your cabinets can drastically alter and improve the aesthetic of your kitchen. 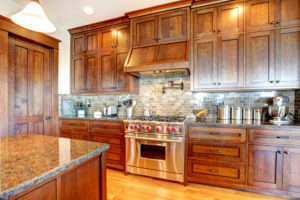 If you or someone you know in Utah is thinking about getting new kitchen cabinets, or needs to repair the cabinets they already have, then don’t hesitate to give a call to the best kitchen renovation specialists in the state! Our professional and caring team at Thompson Granite & Stone will take care of you, efficiently and affordably. Thompson Granite & Stone Inc. makes beautiful countertops for customers in the Salt Lake City metro area.